The Access to Justice Commission's Tennessee Faith & Justice Alliance partnered with the Music City Community Court to host an Expungement Clinic in Davidson County on Saturday, November 19, 2016. 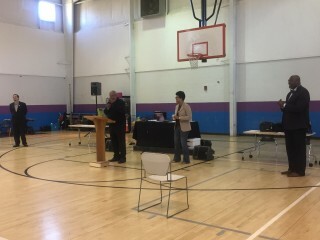 The event was held in the Andrew Jackson Residential Community at the Andrew Jackson Boys and Girls Club. Nehemiah Missionary Baptist Church also shares this space, and Pastor Thomas Hunter, Sr., welcomed the crowd. The Tennessee Bar Association's Young Lawyers Division recruited attorneys for the event. 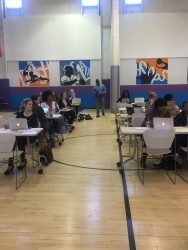 Fifteen attorneys volunteered to review records, give advice pro bono, and appear before Judge Rachel Bell on behalf of attendees. 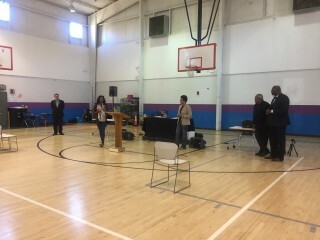 Additionally, the Davidson County Criminal Court Clerk's Office supported the event by retrieving records and processing expungement requests. 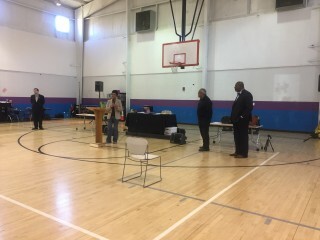 Several members of Nehemiah Missionary Baptist Church, as well as volunteers from the October 1st Music City Community Court event at Watson Grove Missionary Baptist Church, set up the gym for the event, assisted attendees with registration, and ensured the event ran smoothly. Over 75 attendees left with smiles on their faces, after shaking hands with attorneys and saying thank you to volunteers. Expungement is a court-ordered process where the legal record of some criminal cases can be erased in the eyes of the law. In Tennessee, only certain criminal records can be expunged. Some cases can be expunged without any fees. Visit TNCourts.gov/expungements (here) for more information about expungements in Tennessee. You can find more information about the Tennessee Supreme Court's Access to Justice Commission here. Pro Bono attorneys ready to help. Criminal Court Clerk Howard Gentry addresses crowd. Volunteer Coordinator Amber Floyd speaking.